All our cakes are suitable for Halal : they are vegetarian and do not contain alcohol. For our asian wedding cake designs we take inspiration from the beautiful and intricate henna patterns and we incorporate a large number of hand made sugar flowers into the designs. The sugar flowers can be made in any colour and can be matched to your wedding colours. We make a wide range of sugar flowers including: roses, carnations, lilies, cymbidium orchids, moth orchids, sunflowers, gerberas, calla lilies, honeysuckle, foxgloves, daises and various blossoms. We can also use artificial flowers or fresh flowers for your cake. Every cake we make is unique and designed for you. We can give a discount if you order you Mehndi cake when you order your wedding cake. 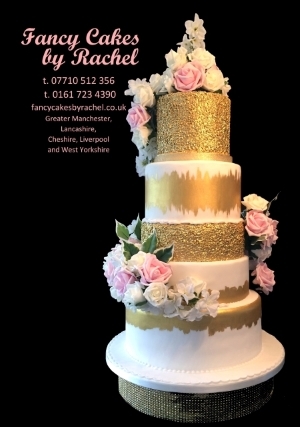 Give us a ring or send an email using the contact us page and we can arrange a meeting to discuss your cake.